Vintage X-Base stool or ottoman in the style of Billy Baldwin. Original fabric should be updated, otherwise solid and clean. Vintage X-base stool or ottoman in the style of Billy Baldwin. Original fabric, some stains to top seat, maybe able to clean, if not plan on re-upholstery. 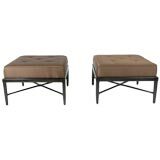 Pair of Mid-Century Modern "X" base Billy Baldwin style benches with new grey velvet. Pair of completely upholstered B. Baldwin stools with Billy's iconic cross leg design. Original peach / apricot velvet upholstery. Measures: 21” W x 18” D x 17” H Period 1950s. Pair of 1970s Billy Baldwin style X stools, nickel nailheads accentuate the form on emerald green cut velvet upholstered stools. A nice matching pair of upholstered stools in the manner of Bill Baldwin. They feature well made solid wood construction with original upholstery. Price includes the pair.